In the last week I received 3 more blocks! I'm getting really excited about this quilt. I need to get on it and finish the inner blocks I'll be making - seen here if you don't remember. 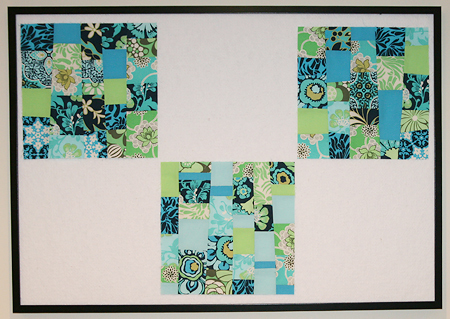 These blocks were sent to me by Lisa of Sophia Aster, Heather of A La Mode Fabric, and Lisa. And do you see how I have them displayed? It's my new design wall! Ever since I saw Ashley of Film in the Fridge's GIANT design wall, I've really really really wanted one. Ok, so mine is 1/6th the size. 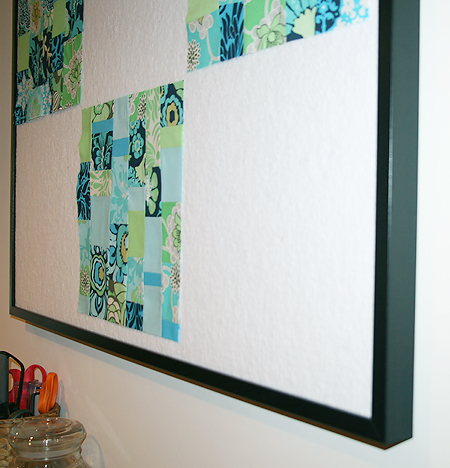 But it really works in the space and I think it will be a great place to display ideas while I hash them out. It was really easy to make. I went to Ikea and bought the largest black frame they sold. I wrapped the plexiglass and backing in a piece of craft sized batting and hung the frame. So easy!